Excel Gas specializes in fabrication of custom built gas cylinder pods / Quads and Cascades as per specific customer requirements. These are fabricated as per required standards of the user industry like DIN, BS, ASTM, DNV 2.7.1. We offer variety of designer Cascade Cantilever that come in various shapes like: round, oval, square, rectangle, with or without rims to suit the designer washrooms. Delicate but aristocrat, these wash basin jalis fits in any place to give the place a whole new definition of class. With the consistent focus on the ongoing market trends, we bring forth a unique range of Hydrogen Cascade. Application: Industry, National Defense, Medical, Industrial And Mining Enterprises And Scientific Research. We are a unique entity in the industry, actively committed to offering an optimum quality range of 64 Cylinders Nitrogen Quad. We are offering extensive assortment of Industrial Gas Cylinder Cascades to our patrons which serves divers industrial purposes at a very competitive rate. The offered cascades are used for storage, transportation and dispensing of gas. We have emerged as the remarkable leader in this. We are designing Hydrogen Storage Cascade, which are used for high pressures applications and from an empty cylinder to a full cylinder quickly. Further, along with gas cylinder manifolds we are also offering a range of optional accessories like pressure gauzes and flexible tail pipes. 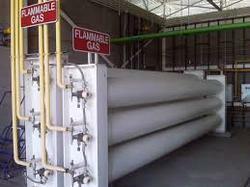 We take pleasure in introducing ourselves as leading firm by offering Cascades CNG Cylinder. Excel Gas & Equipment Pvt Ltd.
Cascade is a product of Applied 1990. Since then it has estabilshed itself as a de-facto standard for wrapping produce in spinning mills. It is implemented in over 400 mills today. Jiolat Auto Gas Industries offers you Storage CNG Gas Cascades. We are providing a wide range of these cascades. Used for fast-fill refueling application in various industrial sectors, this range is sourced from the authorized vendors of the industry. CNG cascades are used for storage, transport and dispensing of CNG gas to vehicles and form the backbone of the CNG infrastructure in the country. MKC has emerged as the undisputed leader in this segment with a lion’s share of the cascade business.